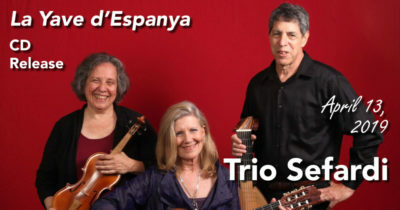 Trio Sefardi is a confluence of three performers who share a love of and wide-ranging experience with Sephardic music, playing with La Rondinella, the Western Wind, and National Heritage Fellowship honoree Flory Jagoda. Washington Post chief music critic Ann Midgette praised the group’s “lovely and luminous performance of Sephardic songs” and vocalist Susan Gaeta’s voice as “compelling” in a review of a recent performance at the Kennedy Center with the Post-Classical Ensemble. Group members combine a respect for tradition with a creative approach to arranging and scoring dedicated to bringing the vibrant past into the living present. Tasty treats available in the kitchen! Make your reservations now at the Carroll Café website.